Are you beginning your hunt for used cars in Terre Haute IN at car dealers Terre Haute, Indiana that is geared towards growing family’s but you are not sure where to start your search? If so, then you need to come to Terre Haute Auto and see one of the many used cars in Terre Haute, Indiana that will be great for your growing family that we have here. Terre Haute Auto is known for having an extensive inventory of used cars in Terre Haute with many different brands as well as styles to choose from at our used car dealership in Terre Haute, Indiana. At Terre Haute Auto, we understand that getting into a used car can seem like a frustrating process at other used car dealers in Terre Haute, Indiana, but you won’t find that here. We have a knowledgeable team that is happy to answer any questions you may have about one of the many used cars for sale near me, like used minivans for sale, at our used car dealership in Terre Haute, Indiana. Our impressive range of vehicles for sale also makes it easy to find many great deals, offers, specials and more that you will undoubtedly enjoy at used car dealers in Terre Haute, Indiana. If you are looking at other used car dealers in Terre Haute, Indiana, take the frustration away and come to Terre Haute Auto because you can find the vehicle you need right here at our used car dealership. Like our selection of used minivans for sale. One used minivan that is sure to catch your eye is the used Chrysler Town & Country Touring minivan for sale. The price of this used minivan is sure to be something that you will enjoy, but there is also a lot more for you enjoy with its list of features and options. This used car has a luxurious interior. This used minivan for sale has leather seats, a U-connect Infotainment System, steering wheel cruise & audio controls, and a rear entertainment DVD player. This used minivan for sale in Indiana is ready to take on all of your driving needs; whether that be going to and from work every day or running errands around Terre Haute. Come to Terre Haute Auto, your local used car dealership in Terre Haute, Indiana and see the used Chrysler Town & Country and take this used minivan for sale on a test drive. For used minivans for sale that can give you reliable performance and a comfortable ride out on the open roads of Indiana, this used Chrysler Town & Country minivan for sale near you is sure to be all that you need and much more. 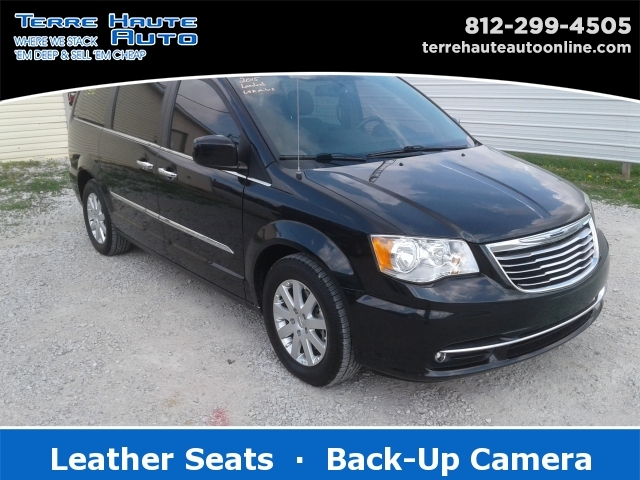 If used minivans for sale, like this used Chrysler Town & Country, is not what you are looking for come and see one of the many other used minivans for sale and used cars in Terre Haute, Indiana that is perfect for growing families. Let us show you just how easy buying a used minivan can be at Terre Haute Auto. Call today to schedule an appointment for a test drive at 812-299-4505. You can find Terre Haute Auto located conveniently at 13350 S US Hwy 41, Terre Haute, IN 47802.